We’ve calculated the average number interactions per physician across several specialty areas by leveraging the 15M+ paid interactions tracked by the MDDetails platform. 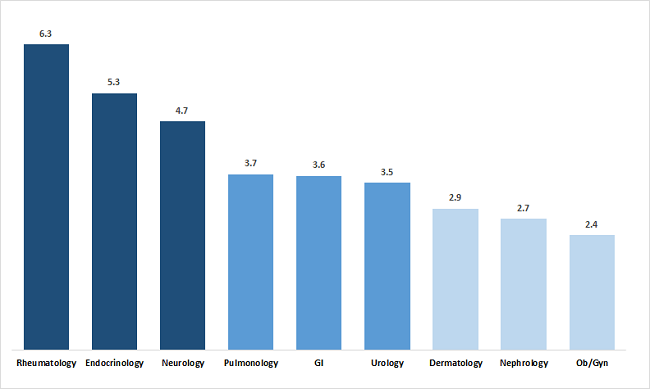 Note that the chart below suggests that the average rhuematologist is engaged more than twice as often as the average dermatologist (6.3 vs. 2.9) through paid promotion. It is interesting to observe the contrast between the competitive callpoints with high call frequency (i.e., rheumatology and endocrinology) and the larger, less intense callpoints with lower call frequency (i.e., dermatology and ob/gyn). The high frequency of calls within the rheumatology callpoint is driven by a wide use of pharmacotherapy as well as several very competitive markets, including rheumatoid arthritis (RA). 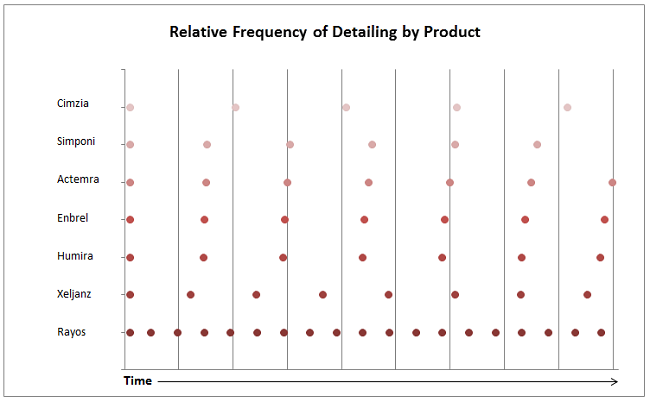 In the figure below we’ve charted the relative frequency of detailing for several products that play within RA. Enbrel and Humira provide a nice baseline frequency for “established” products, whereas newly launched Xeljanz (Pfizer) and Rayos (Horizon) are detailed more frequently. Taking the analysis one step further we can look at engagement within a single practice – Rheumatology Associates in Dallas Texas (a private practice of ~ 11 physicians specialized in treating rhematological conditions). 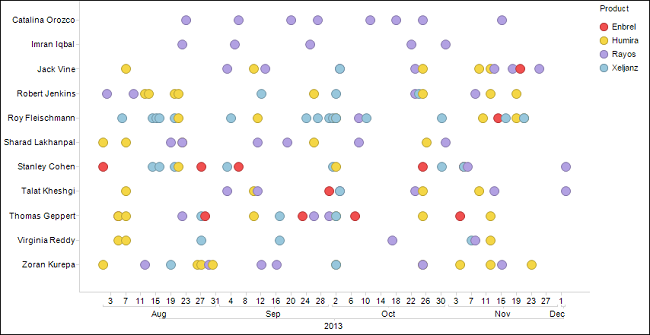 How we can help: MDDetails tracks physician engagement at the practice, product, and physician level. We offer an unparalleled ability to “drill down” and characterize promotional dynamics within key practices/organizations.